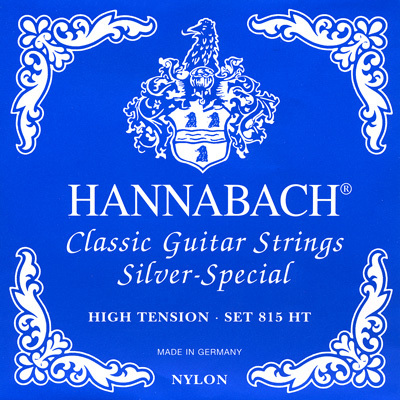 Hanabach 815 Silver Specials are the best performing strings both on my spruce top and on my cedar top! I have a Marin Montero spruce top Granada guitar. It had come with Savarez Corum basses and Galli trebles which a very good concert artist had put on and played a solo recital on the instrument before I bought it. I also tried a few other brands. I liked the Corum basses. They were very strong and firm. The Galli E was very bright and clear which I liked. When I put the Hannabach's on, they were terrible for 3 days. The sound was all over and the intonation suspect. On the 4th day they settled in and were fantastic! These strings are a little darker than the Savarez and Gallis. But they are incredibly resonant, warm, and have a huge amount of punch. Especially from the 5th to the 12th fret, where there is no diminution of power. I just put a set of Corums and Galli's back on to compare, and even having had the Hannabach's on for a couple of months, as I replaced each string and tuned, the new strings were no comparison with the old Hannabach's. I used to be a little snooty about expensive (and ostensibly over-priced) German strings before, but these are well worth the money, and I am now a convert. My teacher recommended that I try these strings on my new guitar. They are great. I don't know if they will be my chosen strings but they do perform well. The review of the strings at your site was spot on. I also appreciate the speed at which the strings were delivered. I think you have a customer for life. I like the strings but alot of the time the 4th string breaks while in the case they must know about it because it comes with a extra D string last set purchased in 5th string broke.Other wise the strings are very nice. The tensions on the back of the package are the most up to date and we will change the webpage to reflect the new tensions. Thanks for bringing the discrepancy to our attention.